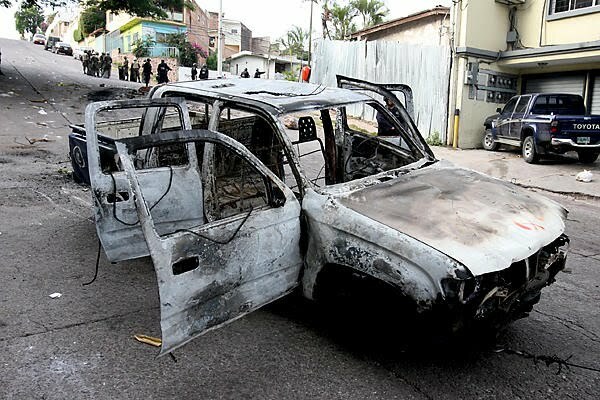 September 22, 2009 – The Embassy of Honduras in Washington DC strongly condemns the use of violence and intimidation by military and police forces controlled by the illegitimate government of Micheletti against the people of Honduras and calls for the immediate restoration of peace in Tegucigalpa. According to reports from the ground, peaceful demonstrators supporting the return of the constitutional president of Honduras are being attacked and beaten and an overall atmosphere of insecurity is now being imposed around the Embassy of Brazil where President Manuel Zelaya is stationed. 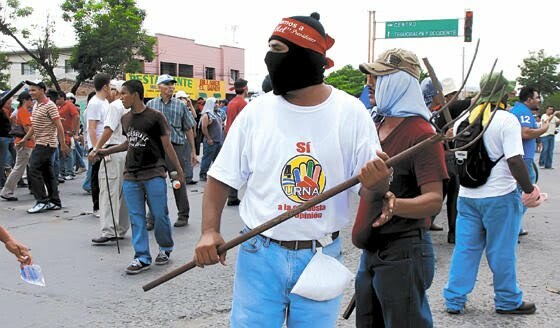 La Gringa's got some pictures of those peaceful, masked, pitchfork-wielding demonstrators and much more on the violence and who's behind it. I just want to know who's paying to keep the lights on in Zelaya's Tilden St propaganda office.